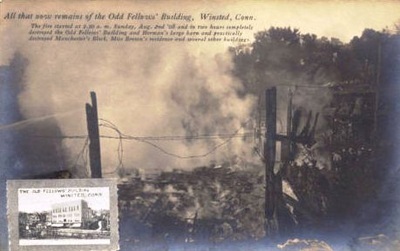 BIG FIRE IN WINSTED, CONN.
PROPERTY VALUED AT $80,000 DESTROYED IN BUSINESS SECTION OF THE TOWN. Winsted, Conn., Aug. 2. 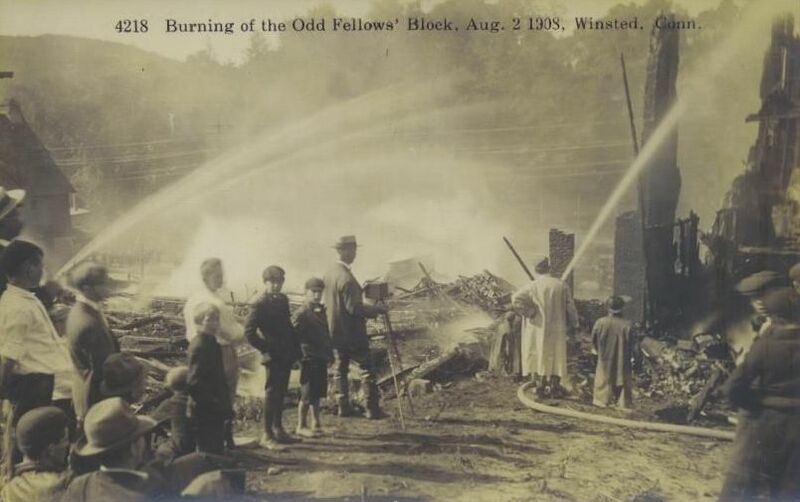 -- Incendiaries to-day started a fire in the armory here which destroyed property valued at $80,000 and endangered the lives of a score of people, who were taken from the third story windows of Odd Fellows' Building, a five-story brick structure opposite the armory on Main Street. Many persons had narrow escapes from falling walls. 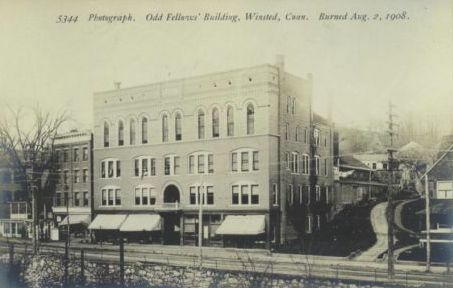 WILLIAM BRENNAN, living on the fourth floor of the building, west of the Odd Fellows' Building, was aroused by the barking of a Boston terrier. His apartments were full of smoke, and after waking his family, he gave the alarm to the other tenants. 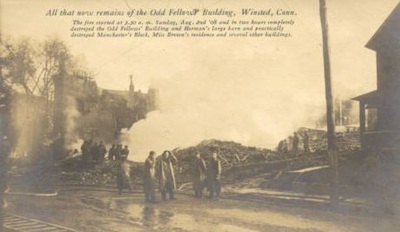 The whole roof of the big armory, which was a wooden structure, was a mass of flames. 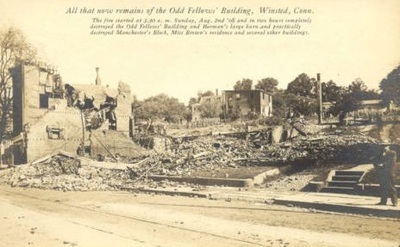 The fire spread to adjoining buildings and across the street to Odd Fellows' Building. 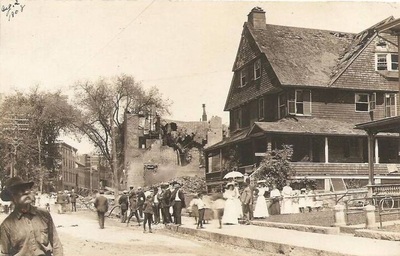 Eighteen people were taken down the ladders from this bulding. MRS. LUCY EATON, living on the third-story of the Manchester Building, fought a fireman when he tried to get her out of the burning building. She declared she wouldn't leave till she got her silverware. Three thousand rounds of ammunition went off without hurting any one. The fire completely destroyed the armory, Odd Fellows' Building, the Manchester Building, and the residence of S. A. HARMAN were partially destroyed. 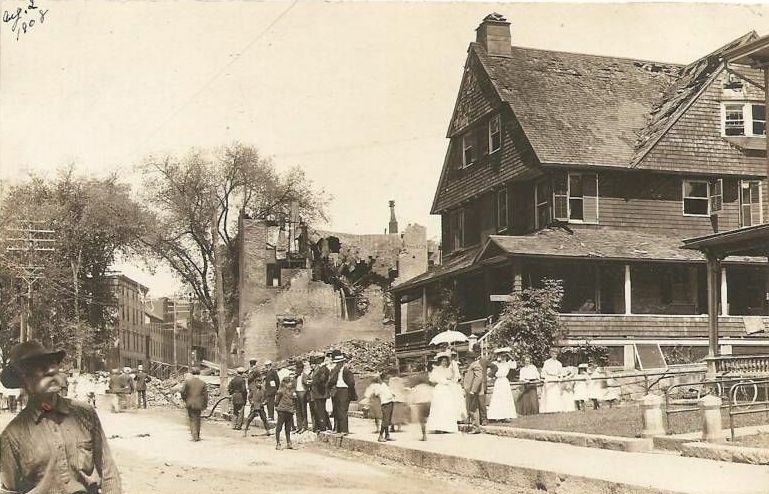 Blazing shingles from the armory ignited the roofs of a dozen houses some of which were a quarter mile from the fire. The stocks of five merchants were completely consumed. Nine families lost everything they had.